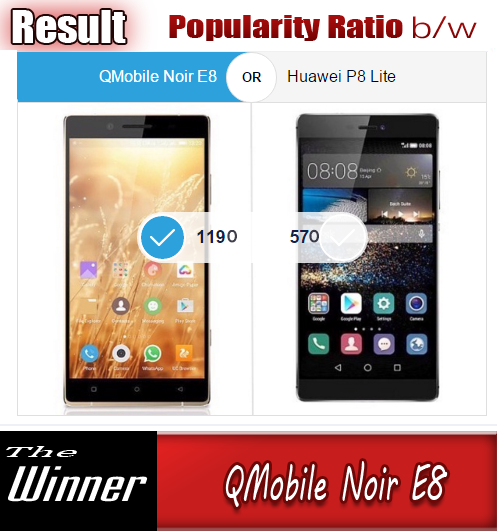 It is very interesting study to know how the mobile phone users are strictly bound to their favorite brand and they only buy the products of their beloved company. A survey was held in 2013 by the Wall Street Journal commissioned in U.S., U.K. and Australian smartphone owners to find the fact that which manufacturers among the major companies had the most loyal customers. It was a very simple test. The Businessman's Bible merely wanted to know how many smartphone owners replaced their handset in 2013 with a model made by the same manufacturer who built their previous model. A handsome number of 3000 mobile phone users were included in this survey. The results were astonishing as most of the users show interest in Apple products. Apple got the first position in this survey .Survey report shows that 76% of those who started last year with an Apple iPhone, ended the year with a newer iPhone model. Samsung was in second position with the 58% retention rate. And in third place was LG. 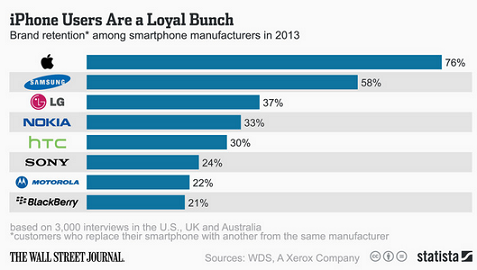 37% of those with an LG smartphone stuck with the brand for their next phone. Nokia and HTC were close to LG with retention rates of 33% and 30% respectively. 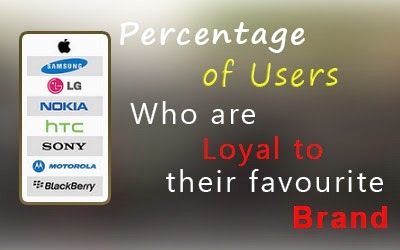 Among other companies Sony got 24% loyal users, Motorola got 22% and BlackBerry got 21% in the final list. So what conclusion can we derive from this information? Perhaps nothing special, because we know the fact already from previous studies. A study we came across some time ago, found that 60% of 2000 polled iPhone owners in the U.K. have a "blind loyalty" to Apple, meaning that when it comes time to purchase a new handset, they buy the next iPhone just because it has an Apple logo on its back, never taking the time to look at latest flagship models made by other companies from the competition.